Do you love spaghetti with ragu alla bolognese? 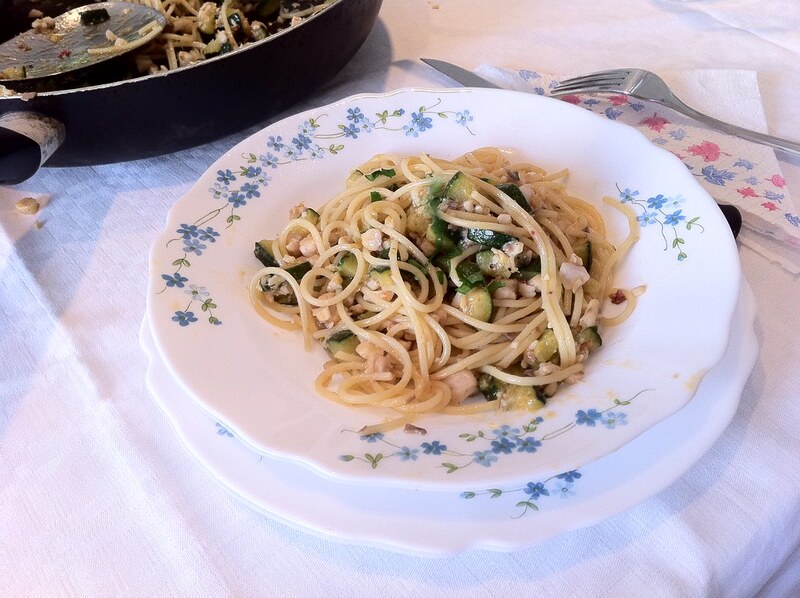 Then try this recipe for linguine with a fish based ragout. Second, we started our weekend pilgrimages to the beaches of Rt Kamenjak nature park. Now, the food. Do you know a simple trick to avoid sticking of the fish to the barbecue? Just two rules you have to stick: the fish has to be extremely dry and the barbecue very hot. 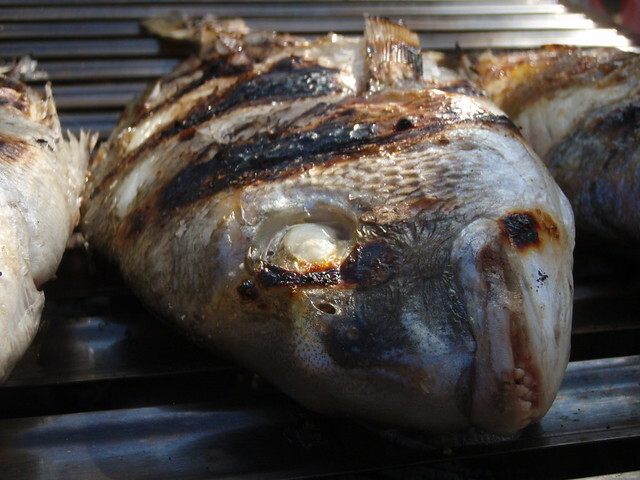 You should not oil neither fish, neither the barbecue. Just don’t be cheap on paper towels and dry thoroughly that poor fish. Before the fish I prepared a delicious primo, a fish based pasta that I simply adore since I tried it last year in Osteria Istriano in Trieste. Ladies and gentlemen, meet simple, cheap but extravagant pasta – linguine with ragout of red mullets. 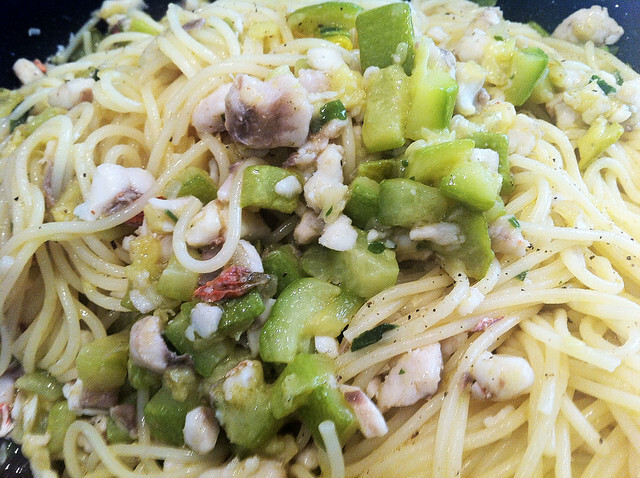 We need zucchini to make our ragout juicy since the fish alone would be to dry. At the same time they won’t overwhelm delicate taste of the fish since zucchini are of pretty neutral taste. I often use this trick even in other sauces. Red mullets (trilje in Croatian, triglie in Italian) are perfect for ragout making since they have a strong taste and the meat keep a certain consistency even when cooked. 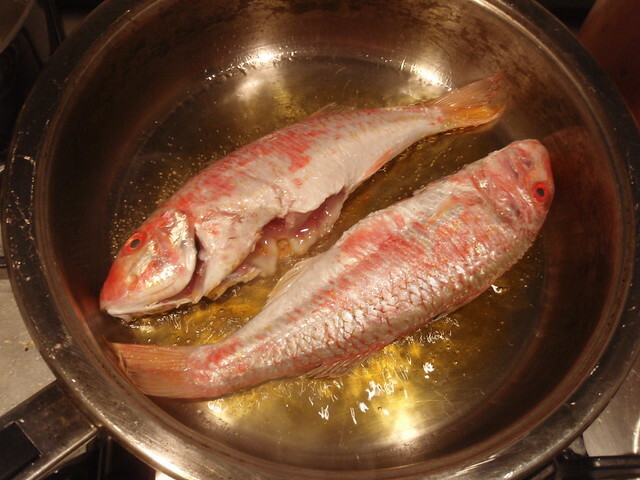 Here is a pic of red mullets when they are prepared in the most common way – just deep fried in oil. And no, no, no! We won’t put créme fraiche (cooking cream) since we are in Istria, on Mediterranean, aren’t we? Extravirgin olive oil and basta! This goes to many chefs in Croatia that have started to ruin traditional Istrian and Dalmatian recipes by adding the cream. Recently my aunt had a fight with the cook in Konoba Ulika in Fažana because she wanted pasta with wild asparagus prepared only on olive oil and the cook had hard time to accept her wishes. Another example is Lidija Kralj, chef of famous restaurant Kapetanova kuća in Mali Ston in Dalmatia. She signed a contract with a Croatian dairy corporation and now you see her on Croatian Masterchef reality show how she puts their cream in everything she cooks. Back to the recipe. Fillet the fish and dice it like you are making minced meat. Dice onion and zucchini. Fry onions in oiled pan on low heat for few minutes, add zucchini dices and cook for 10 minutes stirring often. From time to time add few spoons of the fish stock so that zucchini get a deep, savory fish flavor. When zucchini are cooked but still al dente add minced fish. Cook for another 2-3 minutes, add more fish stock and a bit of white wine. Wait until the alcohol evaporates and your juicy fish ragout is ready. 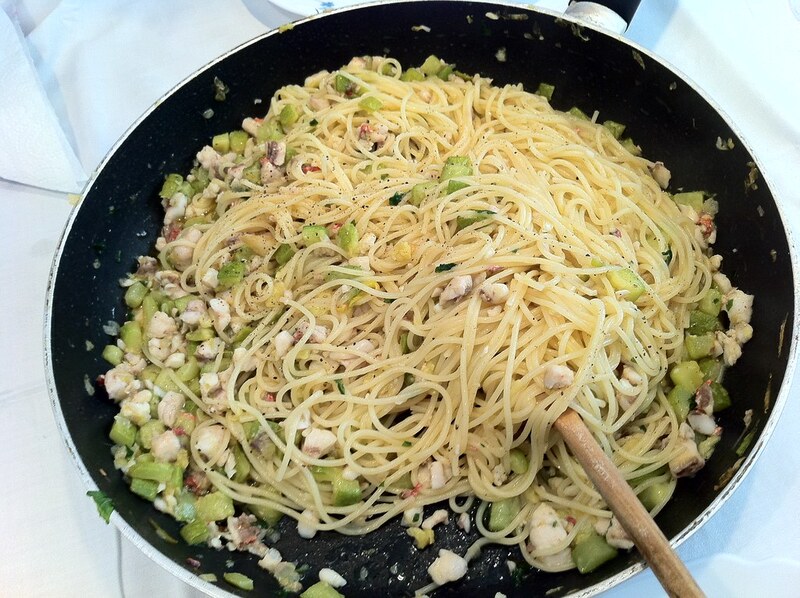 Add linguine directly to the pan, mix thoroughly so that paste absorbs all the juices. Serve directly from the pan. To encourage you to try this recipe I can only say that my guest were more thrilled with this pasta than with the grilled fish. No surprise, during these summer months most of the fish that is served in restaurants in Istria and Dalmatia and that can be bought on fishmarkets is farmed and not wild. Come once in Istria in winter when there is plenty of wild fish and I am sure you will taste the difference. Finally, which Istrian wine would you pair with this dish? Mmmmmmmmm looks delicious! I know it’s gonna sound weird coming from me, but I agree that it’s a crime to put crème fraîche where it doesn’t belong!